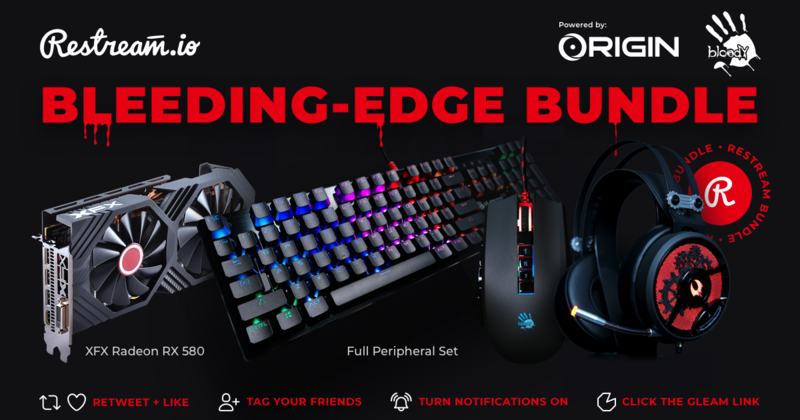 Restream has teamed up with Origin PC and BloodyGaming to gift a couple of their fans with amazing gaming peripherals and gaming GPU! To enter in this RGB Gaming Keyboard Mouse, Mic and GPU Giveaway grab your free entries by following few simple steps listed down below! Software controlled clock speeds can be hindered by overall computer performance. XFX’s True Clock however is hardware controlled clock speed performance optimization, so your card is always running at an optimized performance level. While True Clock locks in a super fast optimal speed on a hardware level, RX Series cards with an OC+ rating are tested at the factory to go even beyond XFX’s True Clock. We encourage you to try these factory tested speeds by using the simple to use AMD Wattman utility, letting you squeeze every last bit of performance out of your card. Bonus entries: Share your referral link with friends to get additional 400 entries for each person who enters through the link. Winner will be contacted shortly after giveaway ends. A winner has to reply back within 24 hours to claim the prize.